The Man O’ War Golf Club in Myrtle Beach is a visually stunning course. 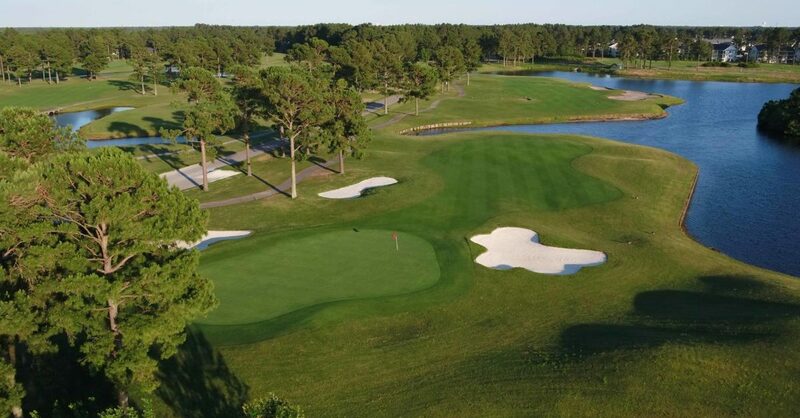 Rising up from the depths of an 80-acre lake, this long-awaited golf course in Myrtle Beach contains drama and challenges. These aspects can be attributed to the design of world-famous architect Dan Maples. The lake at Man O’ War Golf Club is immense, and winds throughout the course. This results in defining holes and changing from ally to enemy, as its sparkling beauty becomes a punishing hazard. The course was voted the 2017 “Myrtle Beach Golf Course of the Year” by the Myrtle Beach Golf Course Owners’ Association. Man O’ War, “Rated 4 STARS by Golf Digest,” features large Bentgrass greens, a practice range and a unique marina clubhouse. The course features many memorable holes, that you will enjoy playing. The par four 9th hole is an island hole, meaning that you have 100 yards to keep your ball within. At 433 yards, it can be even more demanding if the wind is blowing. The par four 12th hole is another favorite on the course. This 423 yard hole is bordered by water up the entire right side of the hole, ending at a green surrounded by water on three sides. Providing that you get your ball to the approach area, you face a daunting task to hit the green. In contrast, the 16th hole on the course is a chance to show off your driving prowess. At 367 yards, this hole gives you a chance to get a stroke by from the course you may have lost earlier.